I must remind myself that the hard to comprehend behaviors being expressed by a person living with Alzheimer's are part of the disease, and are not a deliberate bad act on the their part. It is difficult to describe the range of emotions an Alzheimer's caregiver might feel or experience in a single day. Imagine being happy and then sad, caring then angry, focused then frustrated -- an almost endless stream of feelings and emotions that conflict. The caregiver often lives an anxiety filled life day-after-day. I doubt that many people outside "the Front Row" think about or consider this. Those outside the front row are normally too busy living their own life. Take me for example. I doubt that I communicated the amount of anxiety I felt in any given day to many people. Oddly, the only way most people could find out the way I felt and the way I was thinking was by reading this blog. I say odd because it is likely that the people that read this blog on an ongoing basis knew more about me than my close friends and people I see daily. One reason why this happens is because I am reluctant to be an alarmist and I make a conscious effort not to be too negative. I certainly didn't want to overreact within my own self. In others words, I didn't want to turn me into a negative person by constantly obsessing on the negative. The point here is that Alzheimer's cargivers experience a tremendous amount of anxiety. Lets take an example that is small but real. Most days when I took Dotty to the pool it starts off as an experience that is at best difficult. For some reason, as soon as it is time to go to the pool Dotty's behavior changes. Sometimes, and with a suddenness, she literally can't walk. She goes off into a totally different mind set. When I start moving her toward the door it seems as if her feet are stuck to the ground. She tells me I can't walk, I am going to faint. For reasons related to Alzheimer's disease she just doesn't want to go. It is like a lock is put on her brain and she can't tell her feet what to do. Once out the door it feels like each step is a tremendous effort for Dotty. She feels heavy as I hold her hand. It takes minutes to go 30 feet. Once we are at the entrance to the pool and park the car . Same story. Once I get her into the pool area, I have to listen to more negativity. What the heck are we doing here? I don't want to go in. The water is freezing (the pool is heated). A stream of negative statements. Once we get into the water for a few minutes it all changes. Now, Dotty loves the water. Remarks on how clean the pool is. Asks me why we don't do this every day? Tells me we will come earlier tomorrow and stay for a few hours. I'm riding up and down the roller coaster of emotions. You might wonder how or why I do it. On the front side I feel the stress. Sometimes anxiety and angst. On the backside I see the change in Dotty. Her better mood. The smile on her face. The way she walks better. I feel the elation and feeling of accomplishment. I immediately notice the benefits of this endeavor. In the end the effort is worthwhile. I go from stress to a feeling of accomplishment. I know that Dotty is benefiting from exercise, getting out of the house and into bright light, and sometimes she gets a good dose of socialization at the pool. 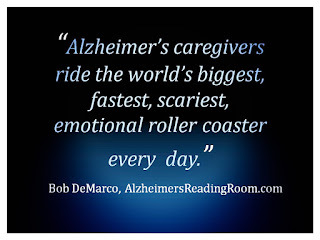 I ride the Alzheimer's disease roller coaster. Ride the emotional roller coaster. I experienced many of the psychological and emotional aspects of being an Alzheimer's caregiver in this one example. An example that is easy to describe. But, only one segment of the daily ride on the Alzheimer's roller coaster. Within this context. I remember when Dotty use to run over to the pool on her own. No car. She walked. She wanted to go. I have to compare that to the current state of affairs. Imagine knowing a person your entire life and then seeing their behavior change -- for the worse. I don't want to confuse you here. Dotty was the same person I always knew. She was not a different person. She was limited by the effects of her deepening forgetfulness. It is easy to miss the past when you deal with Alzheimer's. In order to deal with the pool situtaion, I needed to constantly remind myself that when Dotty was complaining it ws a symptom of the disease. I have a good understanding of this now. Nevertheless, I still felt the angst and the stress inside of me. Every time. I must remind myself that in order to deal effectively with Alzheimer's disease a caregiver needs to come to an understanding that the nutty, hard to comprehend behaviors being expressed by a person living with Alzheimer's are part of the disease, and are not a deliberate action on the part of the person suffering from Alzheimer's or dementia. This is a very thin line. The reminding oneself. It is difficult to remember this all day long as each stressful act presents itself. Even after years of caregiving, the difficulties can impact on your psyche. It took me years to understand and accept this new reality. If you learn that the symptoms of Alzheimer's disease are often the cause of the behavior then you can finally learn to deal with Alzheimer's disease effectively. At the minimum you won't blame the patient for their activity. Or, blame them in the same way that you would blame someone without Alzheimer's disease for engaging in a similar behavior. I know that I had to continually remind myself that many of the acts and behaviors that my mother engaged in each day were the "new normal". This is how it goes in Alzheimer's World. In other words, I needed to remind myself not blame to Dotty, not to blame Alzheimer's, and not to play the blame game. Instead, I learned how to think of Dotty as being deeply forgetful. I thought of Alzheimer's World as being a part of our "new normal". I reminded myself that the ride on the Alzheimer's roller coaster can at times be stressful and scary, but at the end it can also be exhilarating and fulfilling. I remind myself that how you feel at the end is the most important feeling of them all. Title: "Alzheimer's The Emotional Roller Coaster Ride"
The mission and goal of the ARR is to educate and empower Alzheimer's caregivers, their families, and all members of the dementia community.